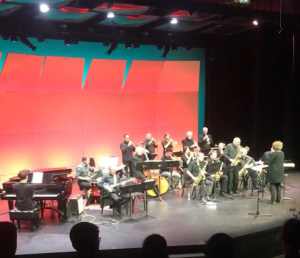 On April 2 Douglas hosted An Evening of Jazz which showcased the Impressions Community Big Band and Douglas College Dues Band, both conducted by director Jill Townsend. The concert was held at the Laura C. Muir Performing Arts Theatre. The Impressions Community Big Band started the night off. “Gentle Rain,” by Luiz Bonfa and arranged by Lisa Despain, had very clean note ends and transitions. This band consists of older and experienced musicians. Townsend only conducted the time, but the band knew their dynamics well enough to do without much more in the way of guidance. “This Can’t Be Love,” by Rodgers and Hart and arranged by Mark Taylor, was my favourite piece played by the Impressions band. It is a beautiful work that tells a story with lovely solos—especially the trumpet solo by Melissa Hammer which sounded like the main speaker of said story. This piece featured drummer Josh Wright, who put his all into whimsical percussive notes and had a large range of dynamics for his own percussive part. Every instrument sounded like they had their own voice and playful tale to tell. Won’t You Be My Neighbor? is a 2018 documentary that explores the life of Fred Rogers, who is also the composer of the song “Won’t You Be My Neighbor.” Arranged by Mike Tomaro, this piece began with a drum solo which crescendoed into an intro consisting of the full band. It segued then into a sort of call and reply solo between the instruments. This piece was full of high energy with many forte dynamics. The trombone solo in this performance sounded rather breathless and out of tune. The saxophone, however, did very well. “One Mint Julep,” by Rudy Toombs and arranged by Alan Baylock, was a slower song in the night’s set. The alto saxophone solo by Bill Abbott was not only the star of this song, but really had me in awe for the rest of the night. His dynamics between piano and forte were striking, his fingerings were quick, and the runs were flawless. Next up was the Douglas College Dues Band, consisting of students in the Music program, Music Technology program, other Douglas students, the community program, and students from New West Secondary School. Uniquely, this band included a tenor ukulele, which is something I’ve never seen before. The band started with a piece titled “Four” by Miles Davis and arranged by Mark Taylor. The tenor saxophone solo wasn’t too far off with notes and pitches, but it seemed to lack confidence and was somewhat quiet and hesitant. “Estate,” by Bruno Martino and arranged by John Wasson, continued the concert with a different sound. Very full legato bass notes at the beginning sounded beautiful, but some parts (trumpets and some saxes I believe) did not sound fully tuned. The trombones, however, were wonderfully in tune. The picked guitar solo by Gabriel Diaz added some spiciness to the piece. “Caravan,” by Duke Ellington, Irving Mills, and Juan Tizol and arranged by my personal favourite, Michael Sweeney, changed up the concert’s sound once again. The song had a fast and mysterious vibe heightened by sixteenths on the hi-hats. Mark Gotay’s trumpet solo was on the mark but too quiet. This wasn’t necessarily the trumpet’s fault though because the rest of the band didn’t quiet down themselves for the trumpet’s melody. I thought this piece needed more blend and balance work for all parts so that the melodies could be heard. “Out of Nowhere,” by Johnny Green and arranged by Michael Sweeney, is a piece that I am sure I’ve heard somewhere before. The saxophones sounded much more in tune during this piece, which means that they probably just needed some warming up. The piano, played by Agnes Lau, was perfectly in time. “Cantaloupe Island,” by Herbie Hancock and arranged by Mike Kamuf, was said by Townsend to be one of the band’s favourites. The piece is fun and quirky, as expected by the title. The saxophones were behind on some notes and the rest of the band was missing time cues as well. Nonetheless the baritone saxophone, played by Alison Cardinall, had an amazingly steady sound, and the drum solo by Zach Huie had an incredible amount of energy to it. For rehearsing only once a week for two hours, I’d say both bands put on a lovely show. I am excited to hear how these musicians develop their skills in the next few years.